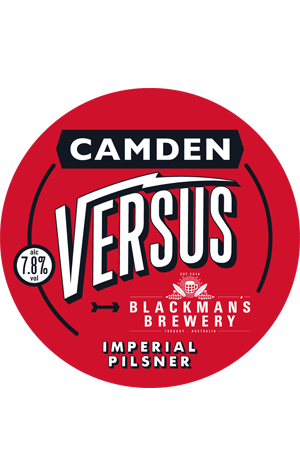 Lager loving brewers Renn (Blackman's) and former boss Jasper (Camden Town) joined forces to create a collaboration beer that was launched as part of their joint event as part of the 2015 Good Beer Week. It was one of four lagers poured on the night – two of them launching there and now making their way to a few other venues in Victoria and New South Wales. For their joint effort, they aimed high: this imperial pilsner nudges 8 percent AVB. And they also plundered an array of locally grown Aussie hops, with Cascade, Ella, Summer and Enigma making an appearance. According to the brewers, it's a beer that "goes out to all the lager haters and those who ‘don’t drink lager’." As such, this is no subtle, gentle quaffer, but instead "big, bold and beastly". We're told you should expect "a sticky golden hue that leads to notes of citrus rind and melon. Smooth, biscuity, sweet-malt body breaks up the hops to make an in-your-face tasty lager that can’t be ignored, not even by the haters."